We have brought up great news for applicants who want to hoist their career in banking sector as now they can apply for the Rajkot Nagarik Sahakari Bank Recruitment 2017-18. Online applications are invited form well skilled and dynamic contenders for filling the Sr/Jr Trainee Executive vacancies. Shortlisted contenders for the Executive posts will get exclusive and sufficient amount of salary package. Individuals are required to fill the RNS online application form before the closing date which is available on the official website of the bank. Candidates, who are willing to apply for the Junior as well as senior Executive Rajkot Nagarik Sahakari Bank vacancies, must ensure the eligibility requirements by going through this page. Candidates who want to know remaining information about Rajkot Nagarik Sahakari Bank Recruitment are advised to check the below section of this page which is well furnished by our inspired and expert team members, have a look below!!!!! Candidates who are going to apply for the Rajkot Nagarik Sahakari Bank Recruitment are required to check the eligibility criteria which we have provided for your convenience. Candidates who want to apply for the Executive vacancies must have graduation (Except Arts) OR Any Post Graduate (Except Arts) However, PGDCA/DCA/JAIIB/ CAIIB / COPA (with 1 year apprenticeship) preferable. Aspirants should have 2 years experience in any Co-Operative bank or any financial institute is preferable and should be well versed with Computer knowledge. After having the knowledge of qualification requirements, individuals should check the age criteria, displayed here. 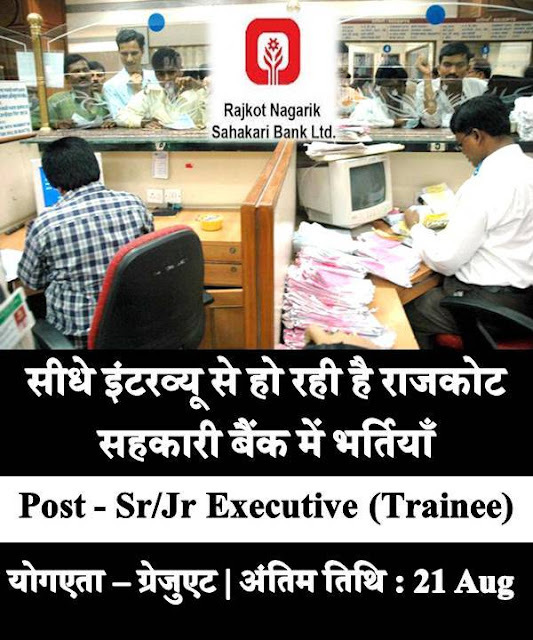 To apply for the Rajkot Nagrik Bank Junior Executive jobs candidates should be less than 30 years of age. Aspirants willing to apply for the Nagrik Bank Junior Senior Executive Jobs should be less than 35 Years of age. Recruitment panel of the Rajkot Nagarik Sahakari Bank will soon organize the interview to shortlist the eligible and well skilled contenders for the concerned positions. Candidates, who want to take benefit of this career opening, must qualify the selection round. Aspirants who qualify the selection round, conducted by the recruitment panel for the Rajkot Nagarik Sahakari Bank Recruitment will get exclusive and attractive pay scale with other benefits. Contenders, who want to apply for the Rajkot Nagarik Sahakari Bank jobs, need to fill online application form. For the convenience of applicants, we have provided the essential steps through which you can easily apply for RNS executive bank vacancies. First and foremost step is to log on to the official website of the Rajkot Nagarik Sahakari Bank i.e. www.rnsbindia.com. This will take you another page, having many job notification links. Here aspirants should select the link of “More Details”. Candidates are suggested to read the entire details, mentioned on Rajkot Nagarik Sahakari Bank Recruitment Notification. After ensuring the eligibility requirements, aspirants should go through the ‘Apply for the Post Online >> Press Here’ link and hit on it. Thereafter individuals should upload their latest Resume. Now aspirants should fill the RNSB Online Application form carefully and completely. After that aspirants should upload required documents as date of birth, caste etc and then press the ‘Submit’ button. Finally, contenders should take the hard copy of RNS bank application form and must keep it safe for further utilize. We have provided the all essential and required information concerning Rajkot Nagarik Sahakari Bank Recruitment on this page. Candidates, who want to clutch further details, are required to follow above displayed link. Stay tuned with us for acquiring latest information about upcoming bank recruitment notifications.